Lilac is June’s Cup of the Month! Lilac is our colour for June’s Cup of the Month. Think of juicy plums as finger foods, asparagus spears or broccoli florets. Whizz up a baby friendly smoothie of blueberries, blackberries and black grapes. Delicious! A lovely story of how Doidy Cup helped Phoebe wean onto an o pen cup. Thank you for sharing. 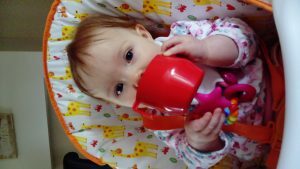 We had begun the weaning process with Phoebe and were finding no success whatsoever in getting her to take a bottle. She is now 7 months and has been exclusively breastfed from birth. We sought advice from experts and they told us to just persevere and also suggested we try other bottles. Despite lots of time and money invested Phoebe still point blank refused to take milk from any bottle. As I am under pressure to return to work I was in despair. One day I was having a discussion with my mum about it and she suggested teething might have been part of the problem. She said she had sworn by Bickiepegs when I was little and she would get Phoebe some. When they arrived, I read the leaflet inside the box of Bickiepegs and saw the Doidy Cup. When I read up about them it made logical sense that they would be easier to wean a baby with and they were a tried and tested, more traditional way to try, so I purchased one from John Lewis. We put a small amount of formula into it and lo and behold Phoebe drank from it like a natural. We’ve been building on this ever since and I messaged to ask for advice as it can get a little messy as far as dribbling milk is concerned. I was given some helpful tips via message and we are going to try them out. Had I known about the Doidy Cup from the beginning I would not have spent all the time and money on the bottles. The cup is simple and easy to use. They definitely seem much easier for a breastfed baby to drink from and I will be recommending it to all my fellow breastfeeding mums. The added extra is that they remove the need to transition from bottle to cup later on. Thanks, Doidy Cup! Turquoise is our chosen colour for Cup of the Month for May! Check out our ideas for fruit and vegetables to introduce this season on our Home page. Great story from @BigBabyBelly regarding their experiences. https://bigbabybelly.com/ Happy to hear Doidy Cup was on hand and weaning went smoothly. The Pink Doidy Cup is our featured colour this month, Available in pastel pink of cerise pink sparkle! Look at our cup of the month section for pink inspired baby foods. The Yellow Doidy Cup is our featured Cup of the Month for March! Think about using it for yellow themed baby friendly smoothies with banana and mango and bring some sunshine into your day. Visit our shop to order your new cup today!